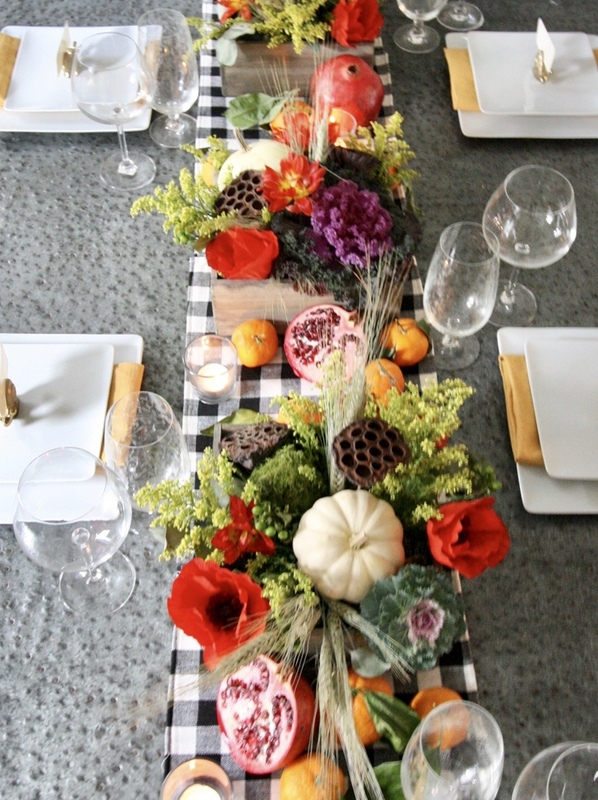 Thanksgiving is about food, family, friends and pretty tables. 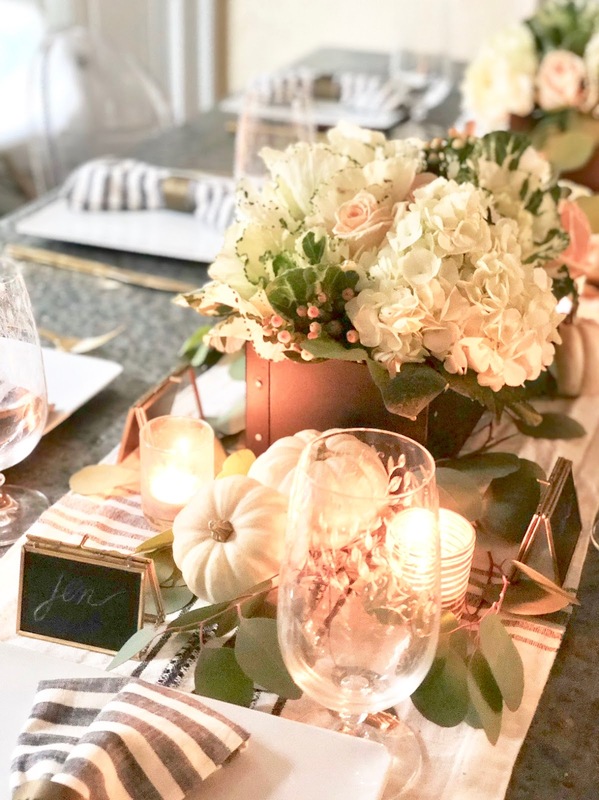 We’re not hosting this year but I thought I’d share my past years thanksgiving tables and give you some tips on how to create a simple tablescape of your own. You don’t have to have a green thumb or crafty. 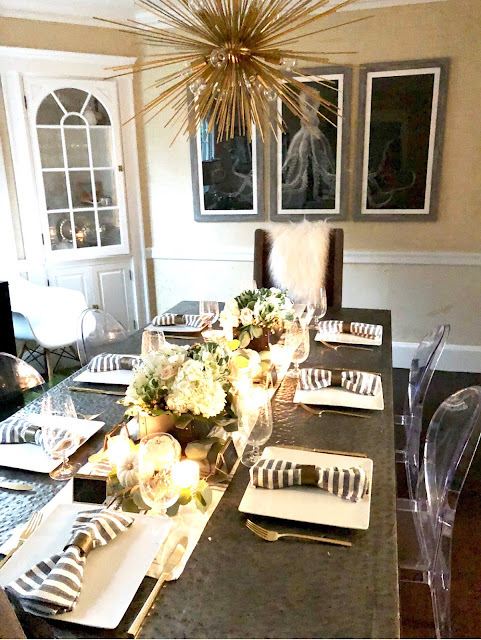 Setting a table can be easy and fun. So while you’re making your shopping list for turkey day don’t forget to add some flowers to the list. All of my flowers I buy at Wegman's grocery store. Here are some of my past years tables and what I used to create them. This was probably one of my favorites because it wasn’t your typical fall colors and it turned out so pretty. 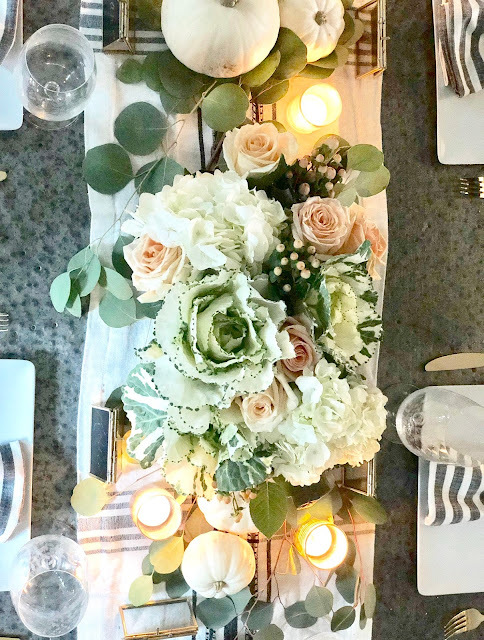 I incorporated fall flowers into my centerpieces with the mini green and white cabbages, mixed with white hydrangeas and blush roses and berries. 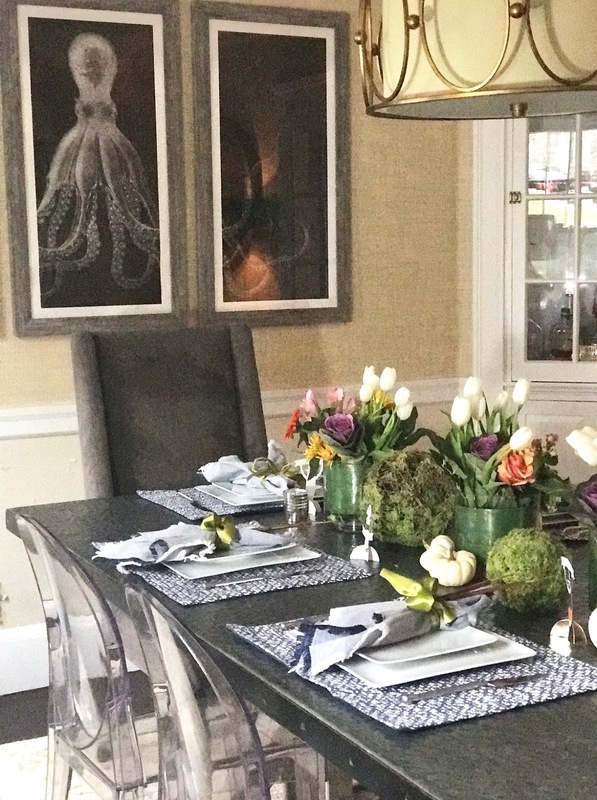 I used hearth and hands black vases which make flower arranging so easy. Just make sure you cut down your flowers so that they aren’t too tall in the vases. I also used my leftover sugar pumpkins and votive candles to fill the rest of the space. 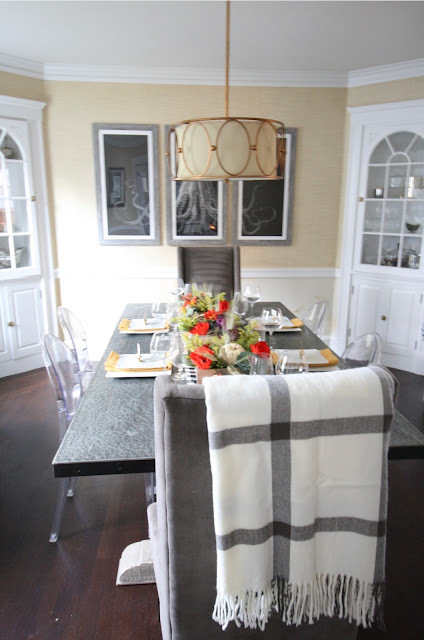 Then there was the year that Nate Berkus gave me a shout out in Instagram with my buffalo check table. He’s been one of my design inspirations since I watched him on the Oprah show so this was really exciting for me even if it was just over a little place card holder, I’ll take it. 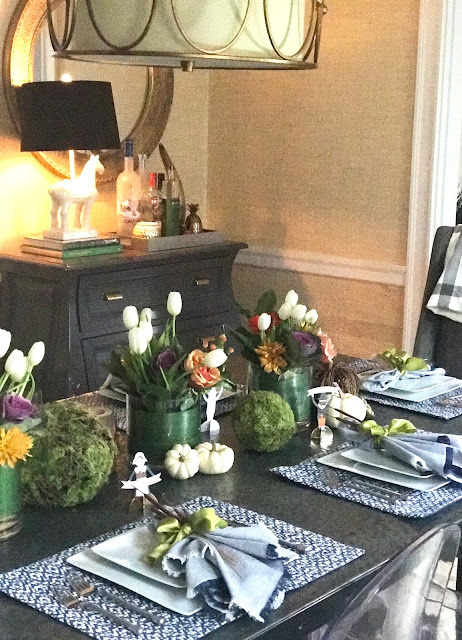 For this table I found a buffalo check table runner in the dollar section at target, used 3 square wooden floral boxes which can also be found at Wegman's or a local craft store and filled with green floral foam. Cut your florals short and just stick them in the foam until you fill up all the empty spaces. To fill up the rest of the runner I used pomegranates (some cut, some whole) and oranges and tree bark candle pillars. I also used Nate Berkus’ cute snail place card holders which aren’t available but you can find cute place card holders at Target, Crate & Barrel and Pier 1. 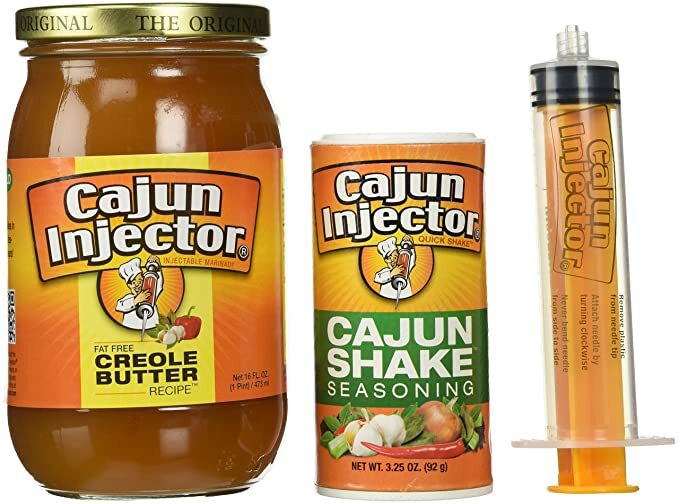 And for the best part of Thanksgiving...all the delicious food. Here are some of my favorite Thanksgiving recipes I like to make every year and are definite crowd pleasers.